The home page for the Evergreen catalog allows you to search for books and other items at your library or libraries. The home page contains a single search box for you to enter search terms. You can get to the home page at any time by selecting the Home link from the left-hand sidebar in Evergreen, or you can enter a search anywhere you see a search box in Evergreen. Subject—finds the terms you enter in the subject of an item. Subjects are categories assigned to items according to a system such as the Library of Congress Subject Headings. You can limit your search by format: Books, Large Print, Audiobooks (books read aloud on CDs or other media), Video (VHS tapes, DVDs, and other media), Music (music on CD or other media), or Electronic Resources (databases or other resources available electronically in the library or online). You can also limit your search by library. If you are using the catalog in a library, the default is to search the current branch. For multiple libraries, depending on how the libraries in your consortium relate to each, you may also search ranges of libraries, or select a specific library. For example, with the Georgia PINES consortium, you have the options local library system, all PINES libraries, and choose specific libraries. If you are searching the catalog from home or another location outside the library, you may wish to choose your branch so that you can quickly see what's available locally. Unlike many catalogs, the search features of Evergreen are forgiving. For example, you do not need to enter authors last name first, nor do you need an exact title or subject heading. Evergreen is also forgiving about plurals and alternate verb endings, so if you enter dogs, Evergreen will also find items with dog. You do not need to use operators such as AND or OR. Evergreen assumes you wish to search for all the terms you enter (AND). You can exclude a term (NOT) using - (minus). For example, vacations -britain will search for materials on vacations, but not Britain. You can search for an exact phrase using double quotes. For example, "Harry Potter" will find only items with the exact phrase, not with the terms Harry or Potter alone. These results show groups of related titles, which may include several editions and formats. For example, Harry Potter and the Prisoner of Azkaban is available in various editions, in large print, as an audiobook, as a DVD, and in Spanish. All of these are grouped together under in a single title group. You can see a list of the separate formats and editions by clicking on the title. The icons under the title and author indicate formats such as books, audiobooks, videorecordings, and other formats. You can click on one of the icons to see only those formats. 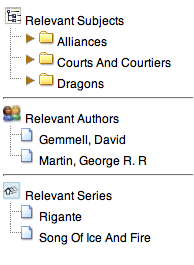 At the left, you may see a list of related subjects, authors, and series. Selecting one of these links searches the catalog again using that subject, author, or series to find additional items. The number of available copies and total copies is displayed in the right-hand column. Depending on whether you've selected a particular library, you may see the results for the branch, the consortium (all your libraries), and any intermediate groupings of your libraries. 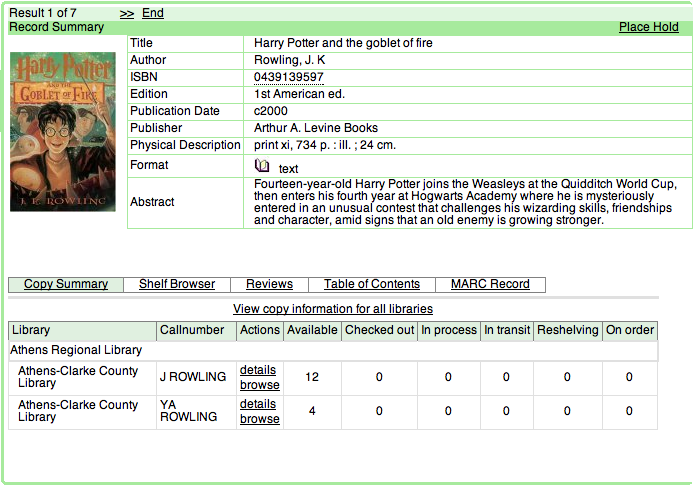 At the bottom of the record, the Copy Summary shows how many copies are at the library or libraries you've selected, and whether they're available or checked out. It also displays the call number for locating the item on the shelves. You can select Shelf Browser to view items appearing near the current item on the library shelves. Often this is a good way to browse for similar items. You can select Table of Contents to see the book's table of contents online (if available). Finally, if you're geeky enough to care about MARC records , you can select MARC Record to display it. You can select the Place Hold link in the upper right corner of the record to reserve the item. If the item is available, it will be pulled from the shelf and held for you. If all copies at your local library are checked out, it may be delivered from another library. If all copies are checked out, you'll be placed on a waiting list. See My Accounts below for more information about the items you place on hold and check out. If you're logged in to Evergreen, you'll see an additional menu labeled More Actions… next to the Place Hold link. You can use this menu to add items to your bookbags. See My Accounts below for more information about bookbags. You can select the link to My Titles Results to go back to the listing of editions and formats. You can select the link to My Search Results to go back to the list of all the results returned for your search. You can start a new search at any time by entering new search terms in the search box at the top of the page, or by selecting the Home or Advanced Search links in the left-hand sidebar. You can access information about your account from any page in Evergreen by selecting the My Account link in the left-hand sidebar (or on the bottom of the home page). Your account information includes contact information, items you have checked out or on hold, your fines, preferences for Evergreen, and bookbags, a place for you to keep reading lists or other lists of items. Each of the sections in the My Account area is described below. * If this is your first time logging in, your username will be your library card number. You have the option to change your username on the Account Summary screen. * You should have been given a password when you received your library card. If this is your first time logging into your account you will be asked to reset your initial password. * If you do not have or cannot recall your password please contact your local library to have the password reset. If you select the Account Summary link at the top of the My Account area, you see your contact and other account information. You can change the username and password that you use to log in to Evergreen as well as the email address the library uses to contact you by clicking the Change link next to the item. If you need to make a change to other information, such as your address, please see the library staff. Select the Items Checked Out link at the top of the My Account area to display all of the items you currently have checked out, their due dates, and the number of times you can renew them. You can simply select the renew link to renew the materials and extend the due date. Items on Hold shows the materials you currently have on hold (reserve). The title, author, format, pickup location, and status are displayed. You may cancel a hold or edit how you'd like to be contacted when the item is ready or where you'd like to pick it up. The Fines area displays any fines or fees the you have accrued. You can pay your fines at the library. Search Hits Per Page: You can increase or decrease the number of results that appear by default when searching the library catalog. Default Font Size: The catalog offers a large font and regular font for display. Default Hold Notification Method: You may elect to be notified of available holds by email, phone, or both. The My Bookbags section allows you to create, edit, share, and remove bookbags. Bookbags are lists of items that can be used for any number of purposes. For example, to keep track of what books you have read, books you would like to read, to maintain a class reading list, to maintain a reading list for a book club, to keep a list of books you would like for your birthday. There are an unlimited number of uses. You can see the bookbags you've created in the My Bookbags section of the My Account area. How do I create a bookbag? There are two ways to create a bookbag. First, in the My Account area, click on My Bookbags. In the Create a new Bookbag section, enter a name for your bookbag into the text box. Decide if you would like to share the contents of the bookbag with other users, and click the Submit button. If you are already logged in, on any item detail page, select the drop-down menu labeled More Actions in the upper-left. The last option in the drop-down is Create a new bookbag. Clicking it will prompt for a bookbag name and create a new bookbag. What does "Share this bookbag" mean? Bookbags can either be private, and only viewable by you; or public, and viewable by anyone who knows where the bookbag resides. By default, all bookbags are private, and you must explicitly instruct the system to allow others to view the contents of a bookbag. You can elect to share a bookbag from the My Account area, My Bookbags section. You can give the address of your bookbag to anyone you want to share it with. In the My Bookbags section, in the list of your bookbags, there is a View link for every shared bookbag. Bookmark this link in your browser or copy and paste the address to share your bookbag. How do I add items to a bookbag? First, you need to be logged in to the online catalog by clicking the My Account link. Search the catalog normally for the item you would like to add to your bookbag. In the item record detail you'll see a drop-down menu in the upper right labeled More Actions. From that dropdown, select the bookbag you would like to place this title in. Alternatively, you can create a new bookbag from this dropdown. How do I remove items from a bookbag? In the My Account area, select the My Bookbags tab. Click on the name of the bookbag you would like to remove the item from. The items in the bookbag will appear at the bottom of the screen. Click the remove link next to the item you would like to remove from the bookbag. You'll be prompted to confirm the removal.